Army Of Anyone: Richard Patrick (vocals); Dean DeLeo (guitar); Robert DeLeo (bass guitar, background vocals); Ray Luzier (drums). 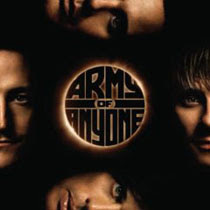 Formed by Filter singer Richard Patrick and the Stone Temple Pilots' Dean and Robert DeLeo, on its self-titled debut album Army Of Anyone plays panoramic hard rock much in the vein of both of its participants' former outfits. "Disappear " appealingly blends prog and pop, managing to sound a little like a Sting song in the process, while "Goodbye" aerates its slamming rock & roll with a pleading, ethereal chorus.